That’s bad news. 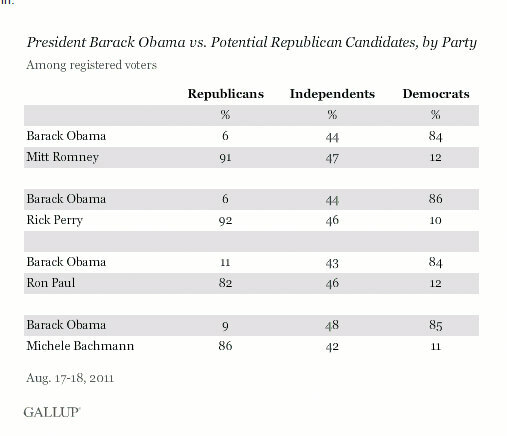 What is greater bad news is that Obama would lose the support of self-described Democrats vs. all Republican challengers while only Ron Paul would lose Republicans to Obama by 10% or more. Needless to say, it is going to be hard for Obama to win if Democrats defect at the rate of 10% or more. The first rule of politics is to shore up your base. Obama isn’t doing that and it may cost him the election. Also, he is splitting independents with his possible Republican rivals. He needs independents to win. As Gallup admits, a lot can change between now and the election. Obama had better hope it does. More importantly, he better get started doing something to change things. It is unlikely he is going to get any help from Republicans so he had better get busy appealing to his base and scaring voters with what could happen to the country if a nut case like Perry, Bachmann or Paul should end up in the White House.